Nucleus Research: Inventory Optimization Value Matrix 2018 - E2open | Demand. Supply. Delivered. Inventory optimization solutions are a key lever which can enable companies to streamline operations while maintaining service levels and freeing up working capital. 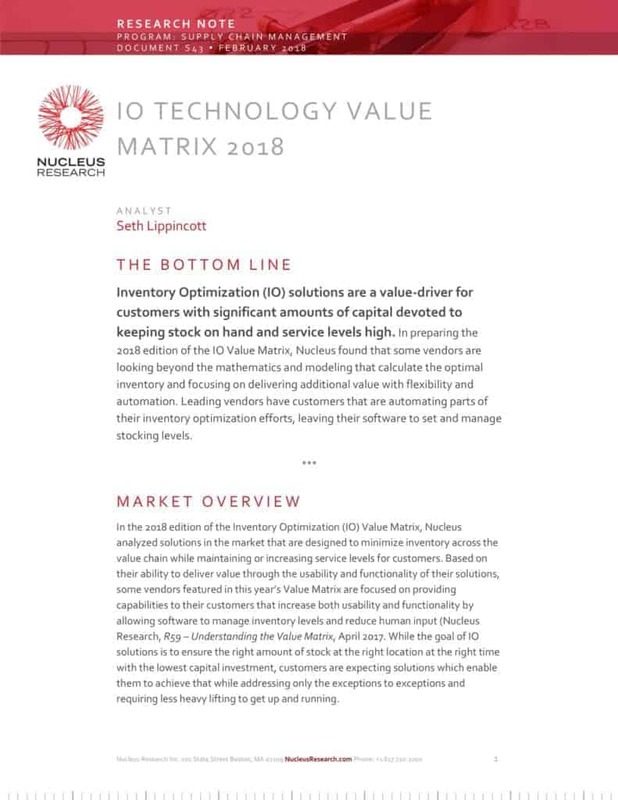 In the 2017 edition of the Inventory Optimization Value Matrix, Nucleus analyzed solutions from 17 vendors based on the usability and functionality, with the leading solutions delivering value to customers with better visualizations, greater automation and machine learning capabilities, and more accurate forecasts. E2open is positioned as a leader in the Value Matrix for its Inventory Optimization solution that allows companies to optimize inventory across multiple tiers of their supply chain, from the store location to distribution and plant sites. Two unique differentiators are the use of specific error over the lead time for each SKU and respecting the location interdependencies at each stocking node. To learn more about the unique features and capabilities of E2open’s Inventory Optimization Solution, download this year’s Inventory Optimization Value Matrix.